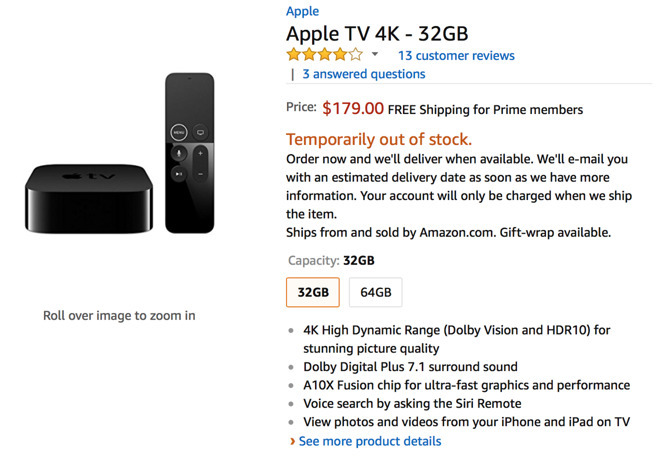 Amazon officially resumed direct sales of the Apple TV earlier Wednesday, selling the new 4K model in both 32- and 64-gigabyte storage sizes. But just hours after sales kicked off, the online mega-retailer showed that both models are "temporarily out of stock." The sell-out comes a few weeks after Apple itself completely sold out of the 64-gigabyte model. As of Tuesday, new orders for the Apple TV 4K in 64 gigabytes won't ship for 4 to 5 weeks, well after Christmas. Apple still has some retail availability of the 32-gigabyte model for same-day pickup. But new orders of the lower capacity won't be delivered until after Christmas, on Dec. 28 at the earliest. 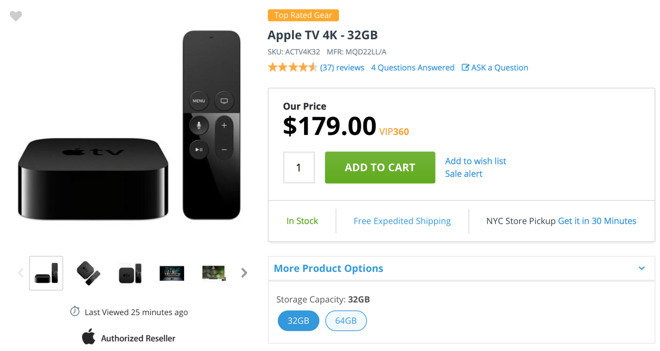 However, AppleInsider partners Adorama and B&H both have the 32-gigabyte Apple TV 4K in-stock and ready to ship, with no tax outside of New York and New Jersey. The 64-gigabyte models are on backorder. Best Buy, meanwhile does have the 64-gigabyte Apple TV 4K in stock to arrive before Christmas, with expedited shipping. Other options can be found in the AppleInsider Price Guide. Amazon withdrew both the Apple TV and Google Chromecast on Oct. 29, 2015, after it claimed that Amazon Prime Video compatibility was necessary for the company to sell set-top boxes to avoid "customer confusion." Amazon could have made that happen with a channel in the third-generation device, or an app for the fourth-generation, but at the time it chose not to do so. That all changed this year, when Apple announced at its Worldwide Developers Conference in June that Amazon Prime Video would be coming to the third-, fourth- and fifth-generation Apple TV units. The free app, which requires login with a paid Prime membership subscription, launched on Dec. 6.